I'm a complete Manga novice, and was hoping some of you serious Manga fans could suggest some titles to get me started. i'm not a huge manga reader, but you should definitely pick up "akira"... SO much better than the anime. possibly look into "fullmetal alchemist" as well. Uzumaki by Junji Ito and Nausicaa by Hayao Miyazaki are two of my favorites. if your looking for Shonen Naruto, One Piece, the first 3 arcs of Bleach, and Bakuman, about 2 Mangaka's. If Adult is more your speed, Berserk. Super Violent, horrible things happen, but it's a great story. Katsuhiro Otomo is my all time favourite artist, the Akira manga has so much more depth then the film, needs to be read. I also read a lot of Hino horror and some other cruder horror mangas. One thing I can't get in to though is reading manga online, I never get in to it, much prefer a book. I agree with Gabe - the Akira manga is a must read and I also love Hino. I recently discovered Chaosic Rune and so far I really dig it. if you are a parent (or want to learn the indescribable joys of being a parent), i recommend yotsubato! (or yotsuba&!). it's amazing how simple, day-to-day activities are often the most engaging stories. the accompanying soundtracks, if you can track them down, are quirky and perfect, too. Not a parent and don't like kids, but if I ever met a kid like Yotsuba, I would kidnap it and keep it forever. ^ "it" that's exactly why you aren't and shouldn't be a parent. ever. Almost anything by Rumiko Takahashi. Maison Ikkoku or the Mermaid Saga are great starters. I don't know if you can find Jirō Taniguchi's in english. He's got very strong stories. For horror, anything by hideshi hino. Junji ito, uzimaki or gyo. The Shonen stuff got a little tired for me, I still watch One Piece but just cant keep up with the manga. Vagabond is something i've been trying to find time to read which has been recommended to me by pretty much everyone else I know who reads manga. Junji Ito's Cat Diary is amazing too. It's almost shameful how often I do that. Anyways, I would feel bad without recommending another Manga. You could always check out the original Dragonball? Uzumaki and Gyo by Junji Ito. Stomach-turning horror. Akira is a must read. I couldn't put it down. Berserk is easily my favorite anime series, and a fantastic manga. The original Devilman by Go Nagai is one of my all time favorites. I really like GANTZ as a way to fill the void left by AKIRA (at least in terms of all the exploding heads.) It's the only current manga publication I collect, and it is positively insane. 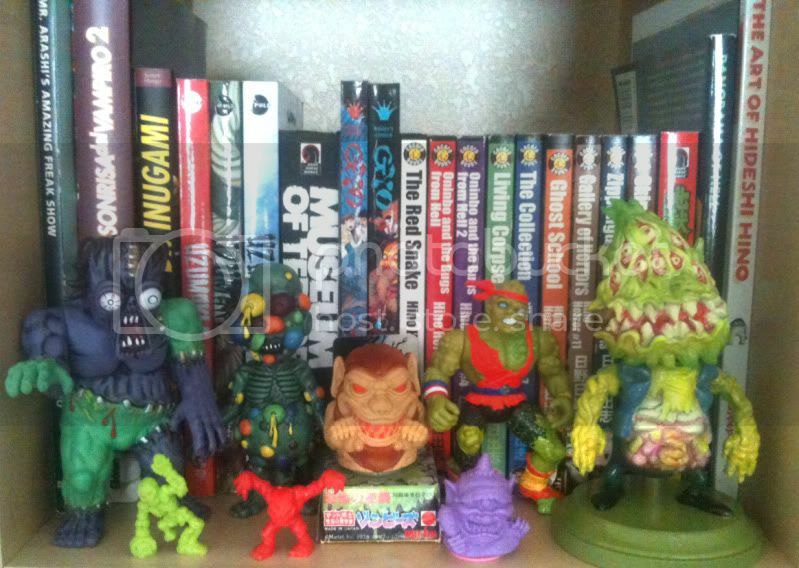 I'm a big fan of manga and an avid collector. It really depends on what genre you are interested in but I'll throw a few out there that I think are classics or just currently enjoying that haven't been mentioned yet. ...I could go on for awhile and will probably edit this to breakdown the genres later. All of these are available in physical format in English. I read Oldboy a while ago, I hadnt read any manga in a few years. It was a lot of fun, worth a read. Berserk was a lot of fun for me and then it dragged on like crazy, but I love the style of that thing. You should have The Moog invite you over to his place. He has good taste in Manga. I could go on . . . . there's certainly no shortage of excellent manga translations out there . . . especially in recent years! Thanks for all the suggestions, I will be doing some major Manga shopping this weekend! just placed all 7 nausicaa volumes on hold at my library! Can we change the title to official Manga topic or something? I'm loving all these suggestions. Plus if anyone wants to discuss whats going on in any weekly or monthly series, that would be great.